Membership is open to all Quail Creek women residents. The Women of Quail Creek is an organization for Quail Creek female residents. Membership dues are $25 per year. All regular monthly programs are free with paid dues however luncheons, field trips, and special events require additional fees. Dues are used to pay for programs & door prizes, donations to non-profit organizations, subsidize bus trips, and cover miscellaneous supplies. *Convenience of the Fillable Form: Complete or fill out the form on your computer prior to printing. Note: Membership dues are non-refundable and non-transferable. There is a box outside Angie Werner’s front door for applications/checks. Address is on the Membership Form. Has your member profile information changed between annual renewal dates? If so, please use the form below to submit changes to the Membership Chair. Don’t forget to click on SUBMIT below the form! If you change to a different email account at some point, this subscribing process must be completed to begin receiving FMM’s at your new email address. 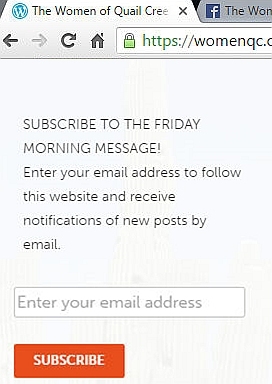 Have the Friday Morning Messages stopped delivering to your email Inbox? CLICK HERE for more information.